Brooke Westfall, Old Fashion Honeymoon from the series The Way We Never Were, 2010. Watercolor, gouache, and ink on paper stretched over wood panel. 24 x 48 inches. When I curated a group exhibition in 2011 that mimicked Tate Britain’s Turner Prize, one of the first artists I selected was Brooke Westfall. 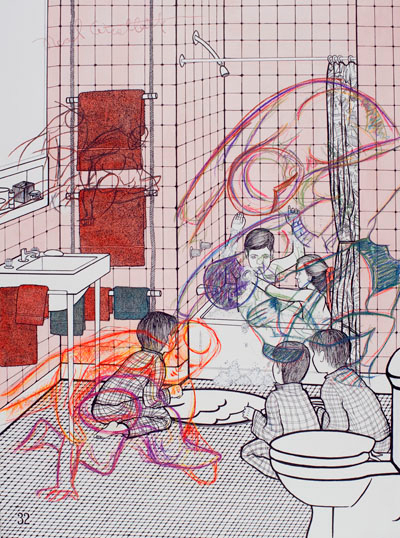 Not only does her artwork reflect everything I die for from an artist working on paper with pencils and watercolor, but she also possesses a fun, light-hearted spirit that is necessary for a neurotic exhibit like mine. 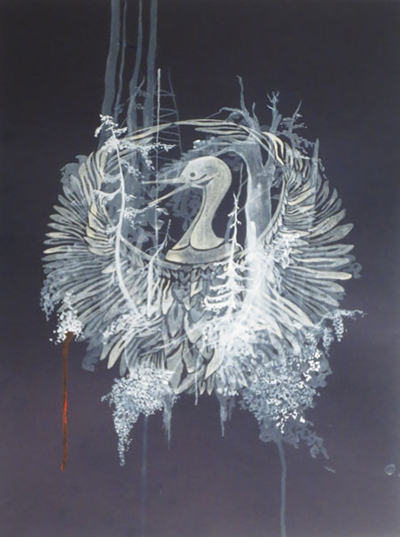 In the last few years, Brooke has established a presence in San Francisco, having worked at the Walter and McBean Galleries at San Francisco Art Institute and being an Artist Studio Resident at Root Division. Regardless of her contribution to the community, her legit studio practice is the kind of behavior that makes me feel bad about my own post-studio practice (or the fancy way of saying that I don’t have a studio — my life is my studio!). It’s no wonder that someone cooped up in a studio into the wee hours of the night would want to start her own interview talking about me. Brooke: I think it’s a smart idea to start my interview talking about you. Why not, right? Jeff: I love that idea! B: I read your first three interviews with Bad at Sports, and I liked that you started Pete’s interview with how you absorbed his exhibition without the art school checklist, started Renée’s interview with her influences and watched YouTube clips, and started Rachel’s interview with your confession about how you had no idea what her work was about. J: Thanks for researching the interviewer! You’re so prepared tonight. B: You’re welcome. I was nervous to meet with you, so I took a shot of whiskey, brought you cookies, and now we’re drinking beer. Brooke Westfall, Tiny Bubbles from the series The Way We Never Were, 2011. Watercolor, gouache, and ink on paper stretched over wood panel. 24 x 18 inches. J: You’re so kind! I’m surprised to hear that you are nervous given the fact that I’ve worked with you on multiple occasions in the past. Do you remember when I spread a rumor to our entire class that the Dean of our school purchased one of your artworks? B: That was annoying! Yes, I remember that prank. J: I don’t know why I did that, except that you were superlatively the nicest person in our class, and I thought it was only appropriate to attack you. B: I think we should explore that idea more. J: My aggression or your niceness? B: Well, both, but mostly the niceness. [giggle] I’m just kidding. J: See! Right there! So nice! Why are you so nice? Is it because you’re from Hawaii? B: You mean my “Aloha Spirit”? J: “Aloha Spirit?” What is that? Is that a real thing? B: Yeah, I have the Aloha Spirit. It’s positive vibes. J: Is the Aloha Spirit in your artwork? 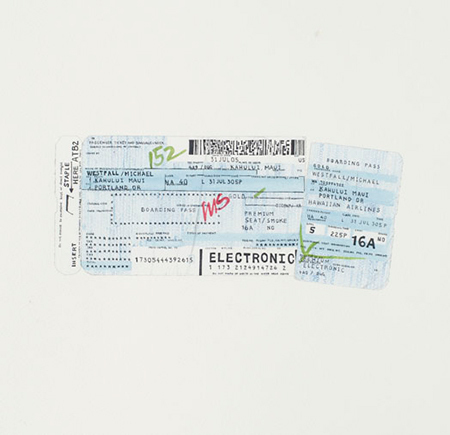 Brooke Westfall, Hawaiian Airlines Ticket from the series Revised Inheritance, 2010. Watercolor and acrylic ink on paper. 16 x 16 inches. B: Before I moved to San Francisco, all my work was about Hawaii, possibly the Aloha Spirit — maybe that can be interpreted as my home and culture. When I moved to San Francisco, I shifted my focus away from Hawaii and onto my observations about mainland culture and haole [pronounced how-lee] stereotypes. B: Haole in Hawaiian originally meant “white ghost”, and today it commonly refers to a white person or foreigner. It’s used as a descriptive term, but it underlines a racist connotation. J: That is so fascinating! I love white people and racism! Now I can say I love haoles. B: …but I do the same thing to mainland people. I actually exoticize mainland culture through mass media, television sitcoms, magazines, etc. That’s how my artworks started. A lot of the images that I work with are borrowed from these idyllic scenes — they’re staged scenes of a bedroom, a lady in a kitchen, kids playing in the living room. But, there’s always a twist that you have to find. Brooke Westfall, Grandfather Resting from the series The Way We Never Were, 2009. Watercolor, gouache, and ink on paper stretched over wood panel. 24 x 18 inches. Brooke Westfall, Grandma’s Secret Recipe from the series The Way We Never Were, 2009. Watercolor, gouache, and ink on paper stretched over wood panel. 24 x 18 inches. Brooke Westfall, Horseplay from the series The Way We Never Were, 2009. Watercolor, gouache, and ink on paper stretched over wood panel. 24 x 18 inches. J: Okay, time out. I’m guessing that most of the Bad at Sports readers are haoles. When you say to them that their everyday lives are idyllic, I think it might sound a little weird and unexpected. What is so interesting about the everyday of an American person living in the United States of America, minus Alaska and Hawaii? B: You mean the “contingent”? B: See, that right there is where language is already separating our biases: I’m describing the contingent United States as the “main” land. I feel like the outsider when I’m talking about the US. J: Even though you’re a complete citizen. Didn’t our president have this same problem? B: Probably, but he is half-black in a very Asian/Polynesian-centric island, so he probably had a harder time identifying with his culture, or his heritage. J: Okay, so what is so interesting about the everyday of mainland culture? B: Well actually, my exploration into mainland culture really stems from the fact that I grew up with my mother’s Japanese family in Hawaii. When I moved here, I became interested in learning more about my father’s haole family. They had all recently passed away at the time, so I only knew them from a distance through stories and brief phone conversations over the holidays. I romanticized their mainland lifestyle and started investigating their journals and documents.Â Hawaii culture is very different from mainland culture. J: Like what? Generalize for me. 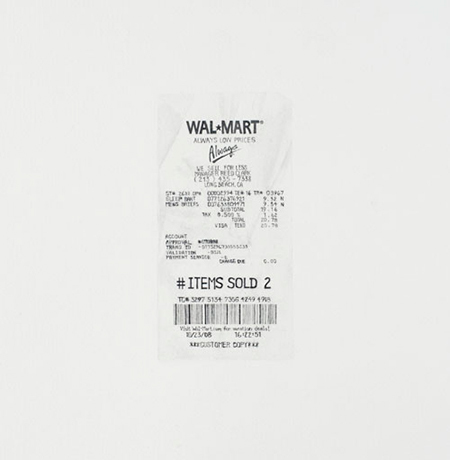 Brooke Westfall, Walmart Receipt from the series Revised Inheritance, 2010. Watercolor and acrylic ink on paper. 16 x 16 inches. 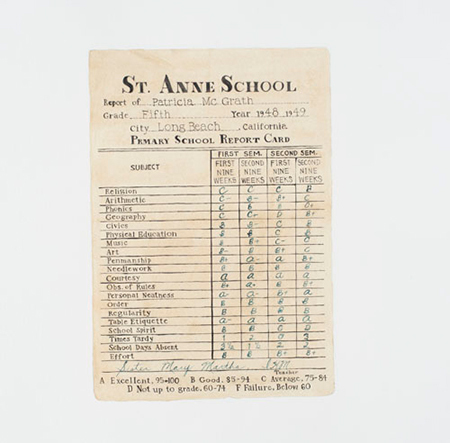 Brooke Westfall, Report Card from the series Revised Inheritance, 2010. Watercolor and acrylic ink on paper. 16 x 16 inches. 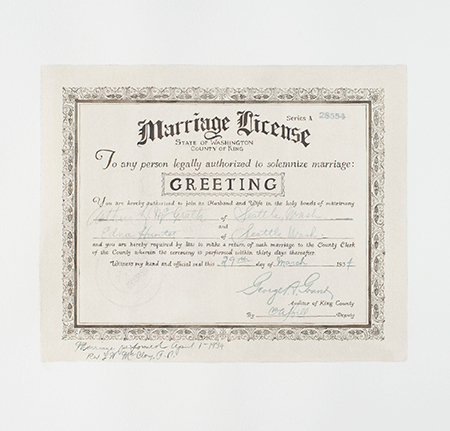 Brooke Westfall, Marriage Certificate from the series Revised Inheritance, 2010. Watercolor and acrylic ink on paper. 16 x 16 inches. B: We don’t wear shoes in the house. We eat everything with rice. We never go to the park — we go to the beach! Mainland people assume Hawaii is paradise and that we don’t have problems. J: Do you watch HGTV? J: There’s a new show called “Hawaii Life” — homebuyers seeking that epitome of the beachy lifestyle. B: That’s exactly how people romanticize Hawaii! Hawaii is always paradise, it’s always lovely, but it’s not to me. I don’t agree because I didn’t grow up in that paradise. It’s not believable to me. But at the same time, it is believable, right? How do we complain about the weather in Hawaii? We don’t. I don’t. But we still have problems — money hardships, death. J: I can’t believe what I’m hearing! I’m having love and relationship issues right now and I just want to move to Hawaii so all my problems can be solved! J: Oh God, Brooke, you’re killing me! Sigh. Okay, so I know you mentioned these themes were primary when you first moved out here in 2008. Are they still evident in your newer work today? 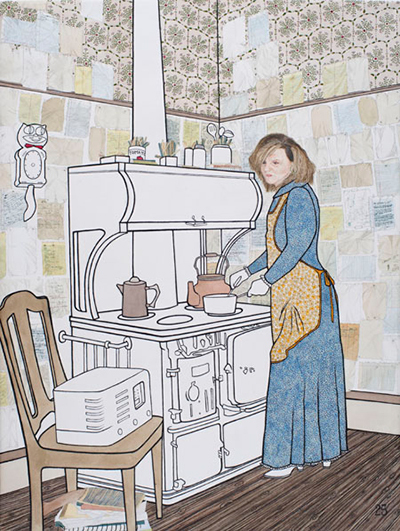 Brooke Westfall, To Overlook from the series White Lies, 2013. Watercolor and gouache on colored lithograph paper. 24.75 x 16.75 inches. J: Like sandals and sandy beaches. 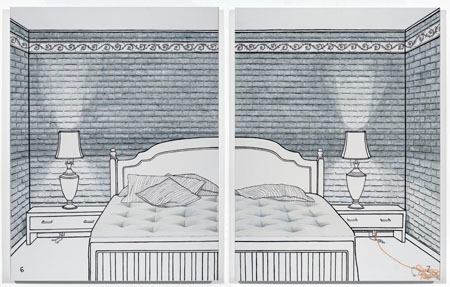 Brooke Westfall, To Weather from the series White Lies, 2013. Watercolor and gouache on colored lithograph paper. 24.75 x 16.75 inches. B: I draw an image and then cover the image with another image. 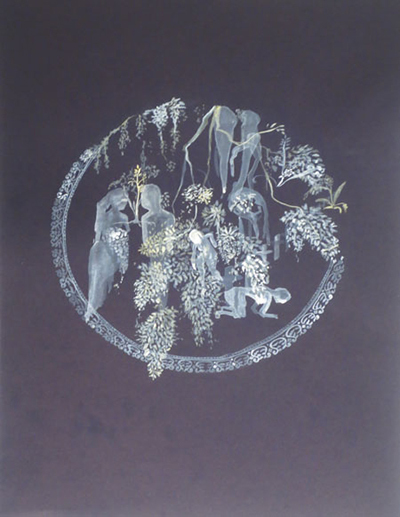 They’re layers of drawings made with white paint on navy colored paper. J: Wasn’t there, like, a serious navy thing that happened in Hawaii like back in the 1940’s? B: You mean World War II? J: There you go — nailed it Brooke Westfall. B: My idea behind the drawings is: you tell a lie and you tell another lie to cover that lie. Is it specific to Hawaii? Maybe not, but it’s an accumulation of all these ideas we’ve been discussing, all these thoughts. J: Your blissful Hawaiian thoughts. J: What were we talking about? B: I don’t remember. So what do we talk about now? J: Did you see The Descendants? B: Yes, I did. I loved it. 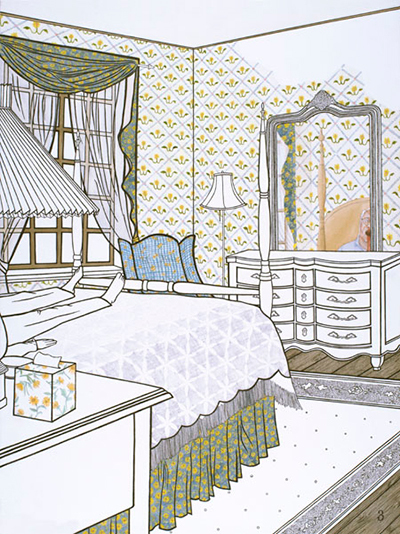 Brooke Westfall, To Sanction from the series White Lies, 2013. 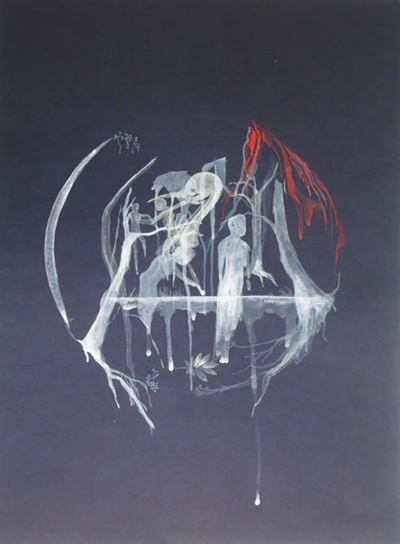 Watercolor and gouache on colored lithograph paper. 24.75 x 16.75 inches. J: Would you say that is an accurate portrayal of Hawaii in media culture? B: I think that quote explains how I feel mainland people describe and define me. J: Whoa, I don’t want to end this interview on such a sad note! B: I know! It started off with my Aloha Spirit and how nice I am, and now we’re at this point. J: Okay, tell me a good Hawaiian joke. B: I don’t know any. Google one! J: Okay. [google] How many Hawaiians does it take to change a light bulb? J: None. Lava Lamps don’t burn out, brah! 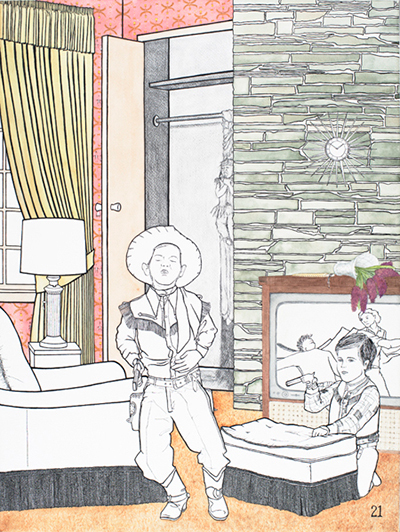 Brooke Westfall’s Revised Inheritance is on view at Spare Change Artist Space in San Francisco, California until June 28. To view more of Brooke’s work, visit www.brookewestfall.com.